Flooding is a concern for any homeowner with a private water well. Potable water is an essential resource that may be contaminated during a natural disaster and reestablishing supplies after a flood is the first step towards restoring stability to the impacted region. In some cases, your residential water well can be brought back online quickly. Aquifers are usually a safe water source because they are naturally protected from the effects of flooding. Even though your aquifer may be safe, if your well is flooded, do not use it should not be used for drinking until it has been adequately tested and in necessary treated to destroy any bacterial contaminants. Testing should be spread out over several weeks because some negative effects may not be felt immediately. Here are some potential impacts that may take time to resolve. Water quality may take time to recover after a flood depending on the circumstances. If the well head has been submerged, even for a short period, it's likely that surface water and potential contaminants have entered the well. • High flood waters can result in surface water that has been contaminated by broken fuel lines, damaged storage tanks or sewage entering the aquifer. • Even if the well head was not submerged, excessive aquifer recharge might raise water levels in aquifers dangerously high putting groundwater in contact with contaminants in the soil. This can happen when rising water tables reach the level of leach fields in residential septic systems. • If you live in a sea coast area and the flooding is as a result of a tidal surge, there could be a temporary increase is sodium and chloride levels. Every residential well uses electrical power to drive the well pump. These pumps are typically either submerged deep in the well (submersible pump) or in the case of jet pumps; the engine is housed above ground. If power has failed, or the equipment has been submerged, there are several considerations before restarting any electrical equipment. • If any electrical components were flooded, they should be disconnected, dried, cleaned and checked by an electrician before restarting the pump. • If you're well has a properly fitted cap and screened vent it has probably not been affected by debris and has probably just received small amounts of sediment. However, if you have an above ground jet pump that has been flooded, it should be disconnected, dried, cleaned and checked before restarting. • Power failures are often associated with flooding or other natural disasters. If you have a backup generator, there are some safety rules to follow before hooking your pump to your generator. To avoid potential electrical problems, your well pump should be disconnected from the power source before connecting it to your generator. Unless the connection has been made previously, the work will require a qualified electrician, especially if it is a three-phase pump. Never operate a generator indoors. Once you have dealt with any pump issues and are ready to restart your pump, your well should be purged and tested. Then it's time to begin the disinfection process if contaminants are present. 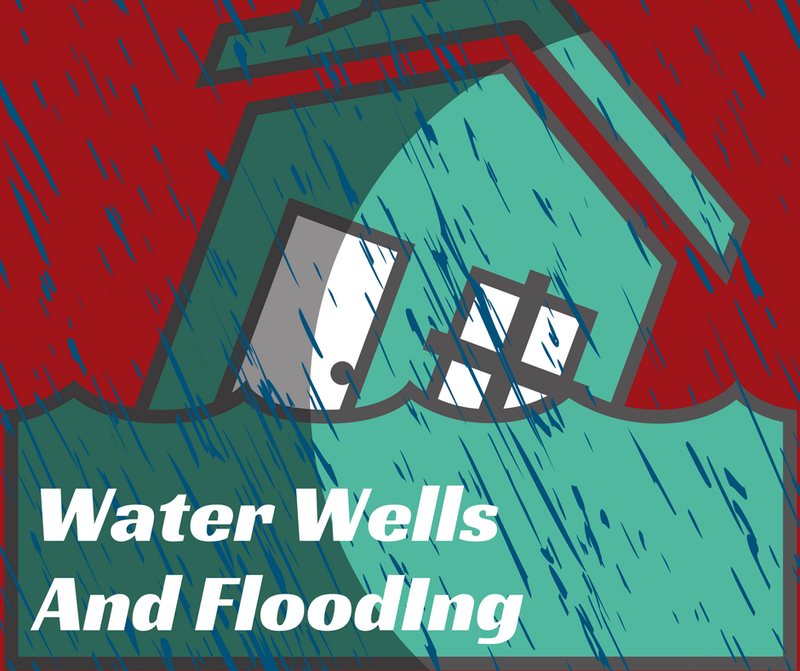 Flooded wells should be pumped down to remove water that may have entered during flooding. This will allow the chlorine disinfection process to work more efficiently. The purged water is best released using a garden hose and should be pumped for at least an hour, or until the water runs clear. Samples should be taken at the beginning and end of the process to be tested for bacteria. If you suspect oil or gas may have entered your well, contact your well water professional to remove them properly. While homeowners can disinfect for bacteria, the most common problem for flooded wells, but you should have a comprehensive test to ensure that your water quality has returned to normal. Home bacteria tests are available at most hardware stores and can give a result in about 24 hours. Beyond bacteria, your water should be tested by a certified laboratory and cleared before consuming any water. As an additional precaution, iodine tablets approved for drinking water disinfection should also be used for a few weeks after the flood to ensure further that your water is safe after purging and disinfection. Disinfection is recommended for any well that may have been impacted by flooding. The easiest way to disinfect your well is to use chlorine-based laundry bleach. The amount used depends on the volume of water in your well. If you are unsure, how to proceed, contact your local water well professional. Flooding is no joke. It can severely impact the quality and safety of your home's water supply. By quickly taking the appropriate steps, you can mitigate your risk and return your well back to health soon after a natural disaster. If your water well has been impacted by a natural disaster, take the necessary steps and contact your water well professional to ensure that testing and disinfection are adequately handled. Your water well is a valuable asset. Make sure to protect it after any natural disaster. To learn more, contact Skillings & Sons. Our professional water well staff can help you test your well water and ensure your well is back to normal after a flood.